Herberton Shire, an area of 9604 sq km with a population of about 5400 people, was generally 90 km west of Mission Beach and 120 km south-west of Cairns. The shire's northern area contained Herberton, Ravenshoe and Mount Garnet along with the former towns of Irvinebank and Tumoulin. Herberton Shire was amalgamated with Atherton, Eacham and Mareeba Shires in 2008 to form Tablelands Regional Council. All of the shire lay in an elevation of 500 metres or more and the Hugh Nelson Range, east of Herberton and Ravenshoe, is 1000 metres or more. Further south the Cardwell Range separates the shire from the coastal lowlands. The shire was drained by the Herbert River which empties into the Pacific at Ingham. Among the Herbert's numerous tributaries is Wild River, which runs through Herberton. The Herbert River was encountered by George Dalrymple in 1864 and named by the Surveyor-General A.C. Gregory, after Queensland's first Premier (1860), Sir Robert Herbert. The town of Herberton was named in 1880 by mineral discoverers, treating the river and its Wild River tributary as one watercourse. Herberton borough was formed in 1888 and included in the Tinaroo local government division. Tinaroo division was subdivided in 1895 and part of it was united with Herberton borough and became Herberton division. The discovery of the Great Northern tin lode at Herberton in 1880 by John Newell and William Jack immediately attracted the attention of their former employer, John Moffat. 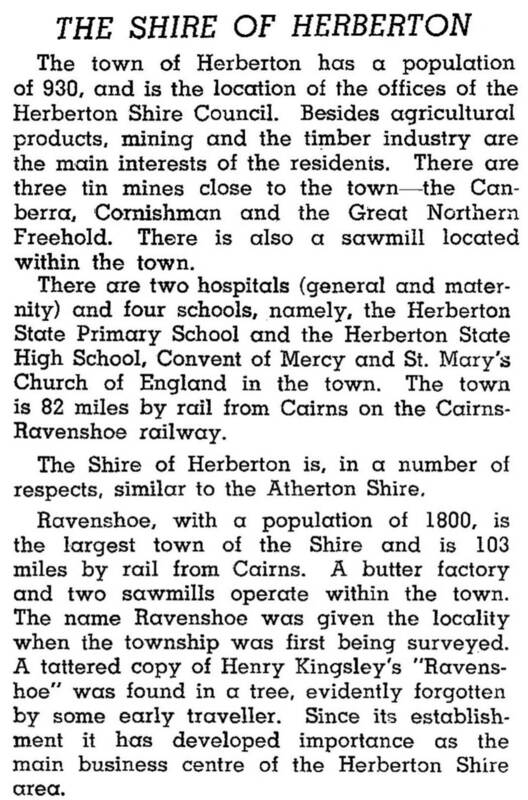 Already involved in tin smelting at Stanthorpe, Moffat invested in the Herberton lode, and soon afterwards in mines at Irvinebank and Watsonville, west of Herberton. He was also involved in the development of Mount Garnet in the 1890s. The hinterland south of Herberton was under the Evelyn and Woodleigh pastoral stations, but in 1891 valuable stands of cedar were found at Cedar Creek (Ravenshoe). Again, Moffat purchased the relevant land interests, and installed a sawmill (1898-99). The balance of the pastoral runs was subdivided for dairying. The timber industry received a setback in 1988 when the rainforest was added to the World Heritage Register, and the industry has resorted to plantation pines. Dairying has contracted, the industry being concentrated around Malanda and Atherton. In 1992 Herberton Shire's main agriculture activity was cattle grazing (68,000 head) with dairying having 3900 head. The township of Tumoulin had disappeared, along with the railway which closed in 1988. The shire, however, shared many of the qualities of the Atherton Tableland, including salubrious climate that supports maize, pasture production and orchards.